Blizzard changed couple of days ago. "(...) Fargo Flintlocke in Stormheim Quest "Wibbly-Wobbly, Timey-Wimey"
I do love Doctor Who references in WoW. Fargo Flintlocke in Stormheim Quest "Wibbly-Wobbly, Timey-Wimey". I'm still trying to figure out how to get the hearty feasts at 102. I've played on the beta for a few months and never got the recipe for it even once I got to 110. Not to mention it requires a reagent you need to be 110 to get and the quest is green by then. So, expect to pay a small fortune for them on the AH or plan to not have most of these quests done at 110. Allows an engineer to make bombs and gizmos that very often work as intended up to a maximum potential skill of 800. You say the Rank 2 Schematic for the Cranial Cannons are sold by Fargo Flintlocke in Aszuna. When trying to find him at the linked location (65,24) he's not there. I also checked the Stormheim location and he doesnt sell anything. Could you be more specific on where the vendor is? My Engineering skill is currently at 780/800, and all of my learned and unlearned Legion schematics are grey and not showing any potential for skill-ups. The only remaining Legion Engineering quest I have is Revamping the Recoil, as I don't yet have the rep necessary to access the Court of Stars. Does the final quest give profession skill, or am I missing something? Edit: I now have a 3rd rank goggle schematic, and it's showing yellow for skill-ups. Still a long road to 800 skill, but at least possible. Are any recipes yellow after 770? Or do I have to hope that spamming gunpowder charge will still green til 800? 1) Thank god they hotfixed the Hearty Feast thing, but I lost my Reaves Battery schematic in the process. Got it back, when I used the Forgotten Schematics of the Broken Isles item. 3) Reaves' Failure Detection Mode - so does this ress ppl after failing an encounter, or does it turn into a mailbox, as it says on the description? When I finally got Reaves into that mode, it turned into a mailbox, but more like a antena- like devise, that cannot be clicked on. 4) Quest for the 815 ilvl cannon head pieces - it needs you to collect items from a Mythic dungeon (Court of Stars), which is pretty much reputation locked, because you need to be 8/12k revered with the Nightfallen to unlock the questchain. I am very sorry for the rambling and maybe not building this posting properly, but I am so frustrated with those and some other Engineering issues, not listed here. I solved some of them on my own, because Blizzard estimated time to answer my tickets averages between 3 and 5 days. I've been maining an Engineer for several years now. Anyone that has run into similar issues, please report and comment. So far I was unable to find a solution online for the problem with missing schematics, that I have completed the quests for. I'll be thankful to any solution you may have! I don't know then they changed it but the snack module no longer requires the Hearty Feast, instead it is 20 each of big gamey ribs, wildfowl eggs, High mountain Salmon, and Black Barracuda. Makes it easier instead on waiting on Nomi to random it out, or buying them from the AH. The questline section is missing the Fargo Flintlocke quests in Val'sharah: , and . You have to complete these to unlock the level 104 quests. now requires different mats, please update the guide! Spell itself isn't updated too..
Make sure you are current on all your Fargo Flintlocke quests. I couldn't pick up from Didi, and it was because I hadn't picked up Fargo's recent quests. Found him in Val'Sharah at 60/62 to continue the engineering questline. I still hear the debate about the "Usefulness" of the Engineering profession. It may not make a lot of gold, but most gold making professions are exhausted after the first couple months. I argue that Engineering is consistently useful. Useful? I have done literally every profession. After WotLK I dropped most of them, but I won’t digress. I always kept engineering because it IS the most useful! Many of the items I use, I have carried with me since WotLK, like PORTALS: Ultrasafe Transporter: Gadgetzan . I still use the permanent tinker and my and and , to get around in Legion, I got EVERY flight path in the first 2 days! I also used the above engineering gadgets to get to very hard to reach rares and treasures. And when fellow dungeoners or raiders cry “I need to sell stuff!” or “I need to repair stuff!” or “Wish I had a mailbox!”, guess who always comes to the rescue with or and now Reaves ? As an engineer, I can also use Jeeves anywhere to access my bank! In addition to all that, as if that wasn’t enough… I still use those and and everyday! Sometimes I go back to old areas to farm old mats for cool old recipes, so I kept my and . Let’s talk about mounts… the coolest motorcycle mount I made for myself and friends , as well as and and and and . While they may not be “Useful”, no one can deny the maximum cool factor of such gadgets as . Useful? I should say so. Anyone who starts engineering today, from level zero, can still tap into all these things, and the portals, mailbox and other gadgets are now toys, so you make them once and share them with all your engineers. And there IS an AH in Dalaran and Pandaria….. but only for engineers! Day one of 7.1.5: Where are the new recipes? The new quest isn't obvious either. Anyone know yet? The Quest "Wibbly-Wobbly, Timey-Wimey from Fargo Flintlocke" only awards you with the "Intra Dalaran wormhole generator" which is more a vanity thing. The guide needs updating: the new wormhole generator is done through Reeves the robot. To get it you have to (i thought i was being trollled because it contradicts the guide and its a weird unrelated action, but tried it anyway as a last resort) so credits to "By nirv (13,598 – 2·21·87) on 2016/09/12 (Patch 7.0.1)" . 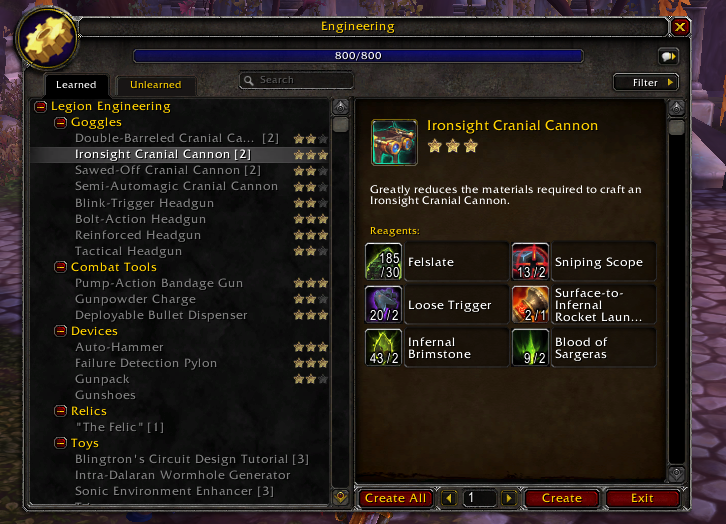 This is important, you might be missing out on a very good engineering skill for Legion. You have to go fishing in black barracuda schools in Suramar (i had 724 fishing and 800 engineering) and got the schematic within 3 pools. Don't know if it works in any school/location. The Legion engineering quests are some of the most fun I've ever had questing you get to test out less than "working" Goblin Inventions and you have to slowly refine them I only wish I could still make the pre calibrated version and I think everyone who did these quests would agree and say Blizzard needs to keep these types of quests up for the next expansion. So for whatever reason, while leveling I thought to myself, I'm not really going to max out engineering. /drop quest. I spent 20-30 minutes figuring out where I went wrong. Flew back out to Val'Sharah and paid a visit to Fargo Flintlocke... Back in business. At least some World Quests only require skill level 75, to unlock. This guide is 100% useless. For all the data on here and all the TL;DR material, all I have on my engineer is one single recipe for a relic that is 100% obselete for me to make that requires demonsteel from the AH that's way to expensive too justify doing. Nowhere on here does it say how to get OTHER less expensive recipes to get started in either mining or engineering so one does not have to spend 6000g for a stack of 20 demonsteel bars for a worthless 880 relic. How is Blingtron 5000 upgraded to Blingtron 6000 or how is Blingtron 6000 acquired? This fixed my issue and would surely fix the issue for anyone else who is experiencing the same bug and would also work with other professions as there are simliar items for the other professions in legion. dropped legion Engineering for BFA, in favor of skinning to compliment leatherworking. Hobart Grapplehammer in Dalaran Engineering trainer sells for 1000g to relearn all your legion recipes.